Review: McLobster | Oyatsu Break! 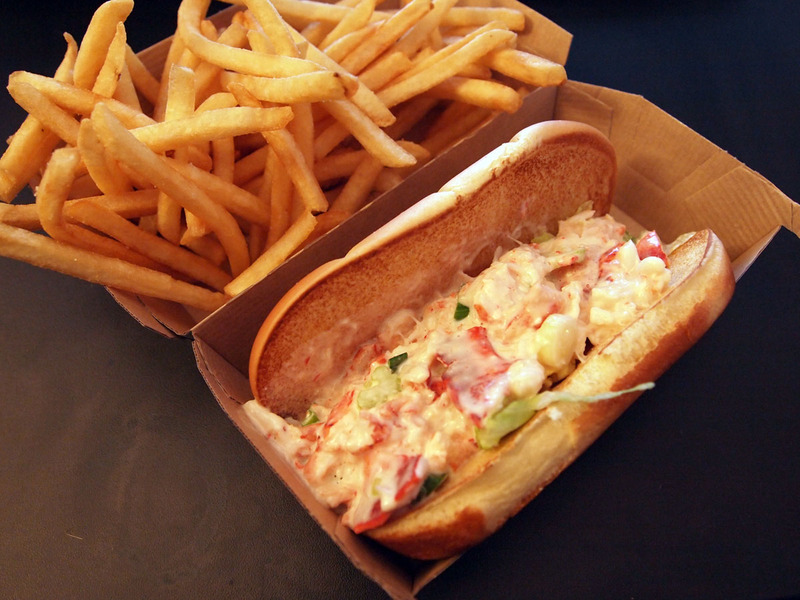 I actually first learned of their existence on a trip to Boston in the 8th grade, where the McLobster on the menu was met with my active fear, because I hadn’t even had real lobster at that point, and wasn’t so hot on seafood. I wouldn’t encounter them again until my first visit out to the east coast of Canada, visiting friends who lived in Halifax, NS, where I had either just missed or was just a little early for McLobster season, I can’t recall now. Don’t get me wrong, I have tried more weird McDonald’s sandwiches than literally anyone I’ve met, thanks mostly to the good folks of McDonald’s Japan and their regional and seasonal delicacies (try the Tsukehime Burger!). But yeah, that most ‘Canadian’ of burgers, from the heart of Atlantic Canada, has been beyond my reach… until today! So, good readers, I hope you won’t mind this slight detour from exclusively Japanese snacking into the wider world of Oyatsu! Packaging: Not just the packaging, but the entire campaign around this sandwich has been pushing the classier aspirations of the sandwich. Clean white serif text on a solid blue background, huge chunks of (surprisingly mayonnaise-free) lobster mixed with healthy green vegetables on a fresh roll. 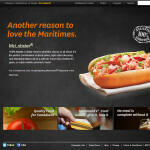 “Atlantic Canada” prominently mentioned in not just the marketing campaign, but on the box itself. They’re going out of their way to convince you of the pedigree of this $6.79 sandwich, one of the more expensive items on their menu. The sandwich doesn’t live up to the packaging though, and while the sandwich in the box is never the same as the one in the pictures, this is particularly notable because none of the pictured sandwiches appear to have any mayonnaise/sauce at all, and the sandwich in the box is drenched in it. You can see yourself in the gallery, but I think this goes beyond the typical food-service-industry stuff and into ‘intentionally misleading’ territory. Despite carrying my sandwich ‘level’ all the way home, the filling ended up scrunched to one side. Scent and Taste: The smell of the sandwich is very ‘fresh’… big on celery and green onion (called spring onion, in most parts of the world), with a hint of that McDonald’s aroma that permeates everything they make. The lettuce might be contributing as well, I suppose, but yeah there’s not much fresh sea scent in this lobster roll, which is a shame. On first bite, the immediately flavours are, again, the celery and green onion, and I don’t get much citrus out of the mayonnaise-like sauce. I maybe don’t get any at all? It probably could’ve used a squirt of lemon. Speaking of liquids, this is a much, much more liquid offering than I’m used to from McDonald’s, most of their liquids having a thick, ‘cauterized’ feel to them, and one presumes that the lobster and vegetables… this is behaving more like fresh seafood, which tends to release water/juices as you eat. Also on the texture note, the lettuce is nice enough and the celery has a very good crunch, and the soft roll isn’t bad. As has been noted in other reviews, it needs salt (which is so weird to say about a McDonald’s sandwich), and I think some could’ve been added without compromising the freshness of the veggies. Here’s the sandwich after I’d adjusted the presentation a little. 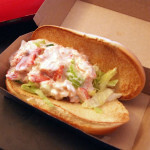 Interestingly, there are chunks of lobster in this thing, and biting into one of those without the accompanying greens/sauce does provide a real lobster taste and texture, but it’s still not at the level of most commercial lobster restaurants (red lobster, etc.,) let alone getting a real, fresh east-coast lobster roll. But unless you pick out the lobster and just eat that, the flavour is overwhelmingly of celery and onions (I got a whole chunk of onion in mine, that hadn’t been particularly well-diced). Also (as you saw in the photos), the filling wasn’t particularly generously applied to mine, but I still think the flavour issues aren’t so much that I didn’t get enough filling as the balance of that filling. Verdict: It only cost 7 bucks, whereas most of the lobster rolls I’ve come across lately have started at twice that price. So it’s pretty safe to say you get what you pay for here, or slightly less. Ultimately, this is a failure as a menu item, at least as it’s executed here, because the balance of ingredients is way off. More lobster added to the same amount of everything else and I could see this being a nice addition or special item. But as executed here, all filler, it’s a wash, which is a shame. 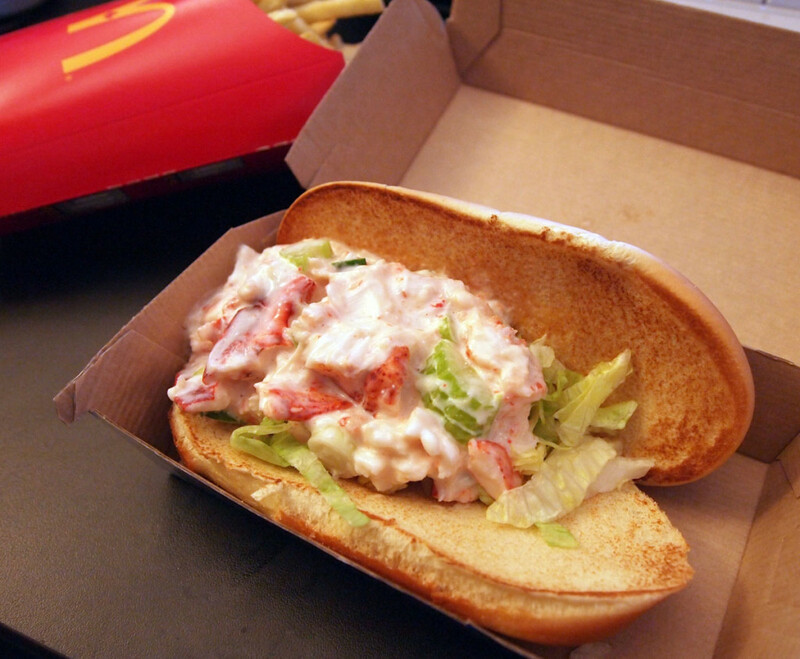 I guess my next question would be, if there was a McLobster that worked like I’ve described, twice as much lobster and a price to match, would people buy it? 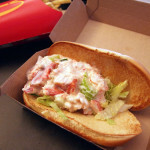 $10, $12 for a McLobster? I mean, clearly I’d try one, but I try these things for a unique experience and cost isn’t really an issue (in most circumstances anyway). 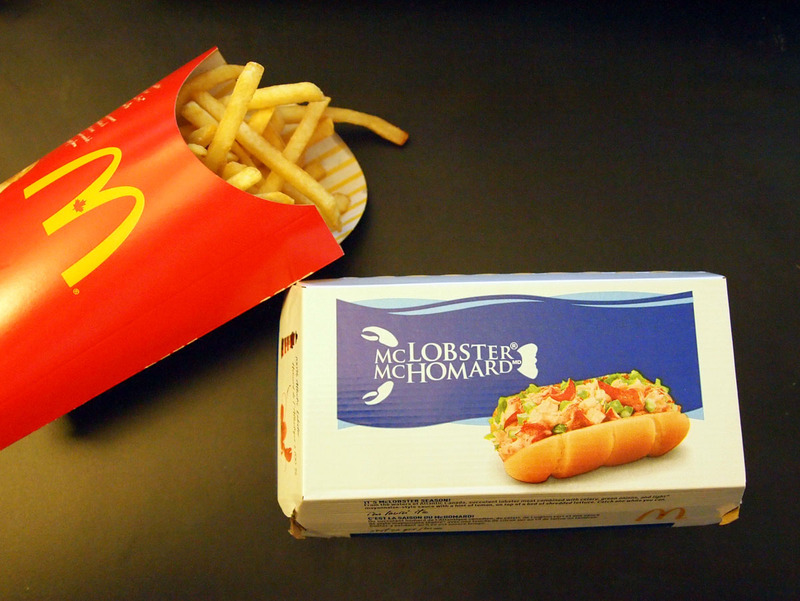 I can’t help but feel like the McLobster on the ads, the one pictured on the box, and the one remembered from my youth, would actually taste pretty good, worth what I’d pay for it. Even at $6.79 this one wasn’t. I live in Peterborough, Ont. 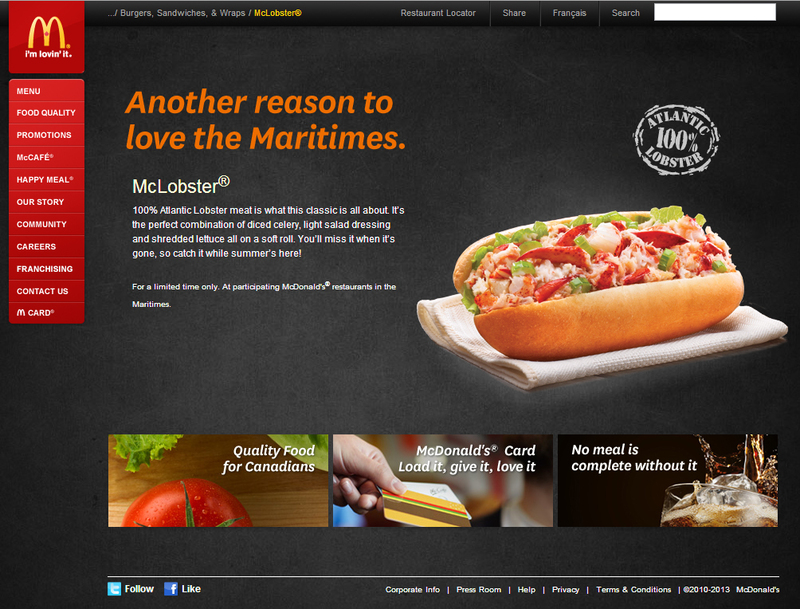 and wanted to try the McLobster. I ordered one at the McDonald’s on Lansdowne St. It was very disappointing to say the least. 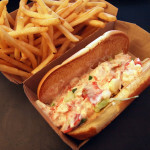 They must have put only one Tablespoon of lobster meat in the bun on top of shredded lettuce. Not worth the price as far as I’m concerned! Their ads are misleading! 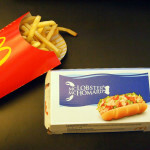 Honestly …McLobster was the worst meal that i have ever eaten in McDonalds ..